Well, it´s not exactly Italian salsa verde in that there are no capers or anchovies…but, it´s a green sauce so that most definitely makes it a salsa verde! Restaurants round where I live have good, simple food. It can sometimes get a little repetitive, and often there´s no menu as they all serve pretty much the same selection of grilled meats (usually pork cuts) and some grilled or fried fish. What you get though is fresh, well cooked and tasty food. Often the meat or fish will come drizzled with a delicious garlic and parsley mixture blended with olive oil. One of our regular local restaurants moves everything outside onto the “summer terrace” during the hot months. This includes the cooking, so you can sit at your table and almost within an arm´s reach you have Luis at the bar, his partner Sonia in the kitchen area and the mountain views. I noticed that Sonia makes her sauce up and keeps it in a squeezy bottle which she then uses to dispense the delicious mixture over the cooked food as it leaves the kitchen and is delivered to us by Luis. All she does is finely chop parsley and garlic and blend with a season of salt and local extra virgin olive oil. I make mine up in the food processor or in a small jug using the hand stick blender. I have now taken to keeping a bottle of this in my fridge. Sometimes I add the zest of a lemon, and squirt it over simple grilled dishes (including vegetables) to liven them up. Sadly, no waiter service at home, so we dished up ourselves! Do give it a go, it´s handy to have around and apart from looking pretty, tastes wonderful. Probably best not to eat it if you´re going out on a hot first date though! Very hand little tip you have provided, thank you. Its raining in Cape Town today so I am rather pleased that we will be celebrating my birthday at home this evening. I will post the menu later. Sorry it´s raining for your birthday…but have a wonderful evening! Cape Town…how fantastic, it´s on my wish list. That’s Summer in a Bottle, you got there. I like your idea of keeping some on-hand in the fridge. It will add a new dimension to anything coming off my grill. Thanks for sharing your recipe. It is indeed…such fresh colours. Mind you, nothing looks very green here in summer…more straw coloured! Fantastic – what a brilliant idea to wizz this up and have handy in the fridge. Now just to wait on the warm weather. Thanks Mandy, we use it a lot. Have a great weekend too! Excellent post! Great and simple recipe! Put it on grilled or oven baked fish and you are sent to heaven!! Bravissima! A bit like a ready made gremolata….it´s so good. I think I need to move next door to you so I can finally learn how to cook. As always, it looks amazing. Too late – I’m moving there first!! Aah, but you get the spare room! We have a lovely olive grove with plenty of room for camping….cooking lessons free of charge! Hi Chica. Thanks for sharing this. I love this source. I didn’t realise it was so easy to make. Will give it a go. Give it a go…you can splosh it on everything! Ha, I’m mainly familiar with the Mexican/Americanized version of salsa verde. I’ll have to try this! 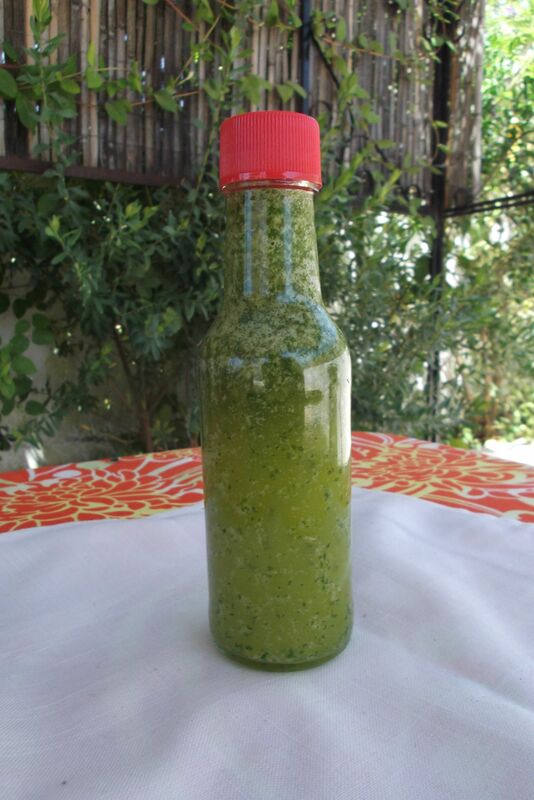 Salsa Verde, any way, is good as far as I´m concerned. This one is super easy and tastes wonderful. I’d love to be dining al fresco on their summer terrace! I too keep a flavored salsa or sauce or vinegrette in my frig each week to my dishes for a boost of flavor. This is a really nice simple variation to try, nothing overpowering but just enough flavor to compliment so many dishes. We just had some at lunch time with a couple of tomatoes picked from the garden and sprinkled with sea salt and this sauce…so delicious! It´s easy just to make a small serving too…just to make sure you like it. Hope you do! That looks delish! I never know what to do with fish when I try to cook it, so it always ends up being a little bland. I’ll have to make some of this! Ooh – great to see you here! 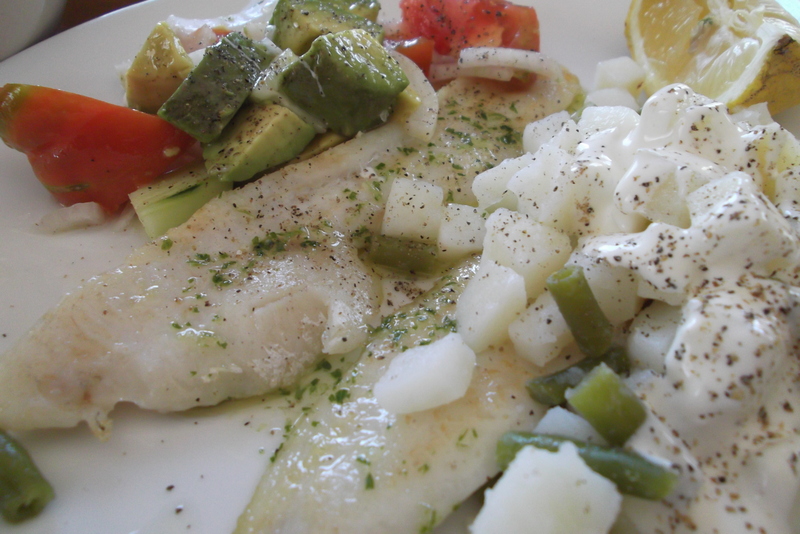 It´s a winner with fish which can sometimes be a little (dare I say it) …dull! Do give it a go. And am so pleased you´re trying the ginger beer – it´s great with a shot of gin in the summer and a warming whisky in the winter! Let me know how it goes. Excellent idea, to keep it around…I’m trying to remember why I stopped doing that a few years ago, but nothing’s coming. Silly me… Thanks for the reminder! I think we all do that – stop making something we really like for no particular reason. But when we start again we remember how good/useful it was! What a great idea to keep a bottle of this ready made! I often pour this kind of mix over grilled meat and fish, but hadn’t thought of making it in advance. It probably keeps for quite a while too but we tend to use it up pretty quickly, so I´m not sure how long! Okay Tanya, so when is the book coming out? If there is a publisher out there reading this then they should be signing you up! Great content, great food, great pics, what else do you need? It must be great to have local restaurants serving good local food. I’m all for it. Put a pinny on Big Man and get him to serve up your goodies!! Have a great weekend. Off to see Simple Minds in our local town tonight. See blog tomorrow for pics! This looks wonderful. I’ll have to give it a try. Have a super weekend dear! Isn’t it amazing, what a few simlpe ingredients mixed together and added to grilled food does to brighten the flavor. A friend of mine always says that if you have a lemon in the house, you can make anything taste great…and I think she´s right! I made this today!!! 😀 Delicious! Thank you! You´re welcome – I bet you start sploshing it over everything! I could happily drizzle this on everything, I’m definitely going to make this, I need more empty sauce bottles though, I’ve been making so many lately, I think I could set up a sauces & pickles business! I sometimes use the little juice bottles that my local bar save for me! It´s a bit of a cheat´s way to turn something simple into something quite exciting with a few shakes of sauce! I´d send it if I could! Oh wow – what a great idea! I have to make some of this, and soon. Thank you!